So says writer/director of The Bone Garden, Mike Gutridge. And that’s an admirable goal as our genre’s rife with leering maintenance guys, bug-eyed garbage men and skulking homeless people. The Baltimorean mostly delivers, in a suburban romp whose tone and setting conjures up John Waters’ Serial Mom (of interest: Waters’ assistant appears briefly in the film as the legendary cult director turned down an overture to appear). At the fictional Carpenter University, Professor Norman Hardy has a way of getting his leg over undergrads. Wife Alice Hardy is on to him though, egged on by boozy divorcee Laurie (an excellent turn by Tammy Kaitz). With nothing to occupy her time other than tend to a field of corn, walk the dog and eventually commit revenge adultery, Alice spies on her wandering hubby and involves herself in a local investigation involving the disappearance of a college coed. Meanwhile, a killer is lurking about with a shovel and a couple of neighborhood newcomers are acting strangely. Alice Hardy, gorehounds will note, is the name of the camp counselor from the original Friday, who gets it in the temple as the kettle boils in Friday the 13th Part II. Here, Hardy is played by Tracie Savage who was Debbie in Friday the 13th Part III. Her brown lab is “Jason,” and investigating officer Detective Meeker is played by Friday the 13th’s Officer Dorf, Ron Millkie. The film is littered with Camp Crystal Lake references, but never enough to bog it down. 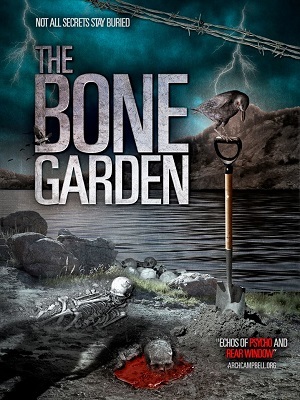 The Bone Garden showcases something that’s rare in horror: sure, there are a few hot college students (including a dance troupe from the university) but the film’s focal point is mostly middle-aged, married suburbanites. Demographics alone is enough to set this film apart and it’s about time focus shifted to the parents. After all, without them we wouldn’t have the next generation of bikini babes and slow-witted boyfriends with car trouble getting feasted on by masked maniacs. It’s a tastefully restrained whodunit with a mondo payoff and the denouement will be apparent to only the most keen-eyed observers. This entry was posted in Horror and tagged 2010s movies, Comedy horror, John Waters by Really Awful Movies. Bookmark the permalink. This kind of thing always catches my eye as I love 80s slashers. You mentioned the F13 references and I’m assuming Carpenter, Meeker, Laurie, and Norman are nods as well. Obviously the filmmakers like the same things I do. Still, naming characters after other characters is something I haven’t found all the cool since junior high. I’m also wary of movies that look like they were cast at horror conventions, but Savage and Milkie aren’t the usual suspects here. I sound like I’m being hard on this one. Truth is, I wouldn’t mind checking it out but I’m not sure I’d actively seek it out. Felt like this is as close to Coronation Street (!) and Serial Mom as you can get in a horror film. It’s perfect for our rating scale, as it’s just marginally commendable in a way it wouldn’t if we did 0-4-star. I agree that there should be a moratorium on self-referential naming in horror. It’s done to death, and horror is the only genre that does it. Could you imagine the latest romantic comedy having characters/buildings named Marshall, Reiner or Efron? It would be laughably absurd. And yet in horror, this convention has been going on for almost two decades now. Reblogged this on Mike's Movie & Film Review.